"Programs like SU-CASA are important because it brings life to the community and its elders. 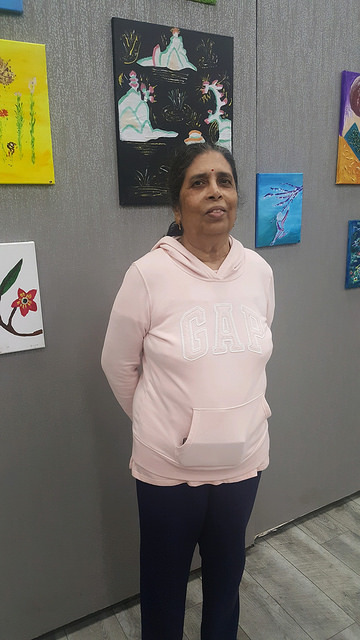 The seniors discover amazing talents and gifts they never knew they had and often mention how therapeutic and healing making art has been for them. My students worked on contemporary art- mixed media, abstract, figurative, landscape and representational paintings. Our final event was an exhibition of over 40 works of art from more than 20 seniors. The best part about teaching in the SU-CASA program is being able to see the growth in the seniors from the first class to the last and the love and joy that they express as they create. The one thing I would tell another artist is that the SU-CASA experience is one of the most humbling and rewarding experiences you can ever have. The wisdom and love that you receive from the seniors are priceless. This is an experience that I think every artist should have." See more photos from the final event on our Flickr page.